Another sterile performance from Wigan Athletic resulted in a 0-0 draw with an undistinguished Nottingham Forest side. Latics did not have a single shot on target. But Mikael Mandron had been playing regularly at Eastleigh and he made his first start yesterday. However, he was replaced on 58 minutes by Gabriel Obertan, who had only a smattering of games for Anzhi Makhachkala in Russia. Once again Joyce had chosen the defensive option of playing central midfielders in the wide positions, but he later switched Max Power for the return of Alex Gilbey after 5 months out through injury. There are only 12 games left for Joyce’s new players to make their mark. Omar Bogle, Matt Gilks and Ryan Tunnicliffe are already established, with Jamie Hanson showing his versatility by playing at right back yesterday. James Weir has had a couple of appearances, Marcus Browne one as a late substitute, but Alex Bruce, Jack Byrne and Josh Laurent have not yet appeared. Will the new players have sufficient impact to steady a sinking ship? Will Joyce amend his negative tactical approach? More than that – will Joyce remain Wigan Athletic manager? We took a look at the social media following yesterday’s match and came up with a wide range of views. 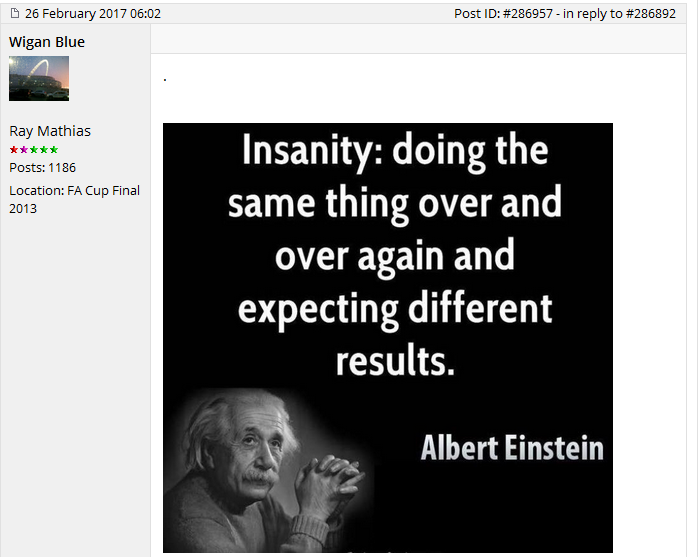 Our thanks go to the Cockney Latic Forum, Vital Wigan – Latics Speyk Forum, The Boulevard of Broken Dreams (Facebook) and Twitter for providing the media for the posts below to happen. Thanks go to all whose contributions are identified below. Memory (only memory) from this game was in the first half and that group of pigeons in the Latics final third in a little group grazing what little grass was on the pitch. They were never disturbed and there isn’t much else you can say to that is there? 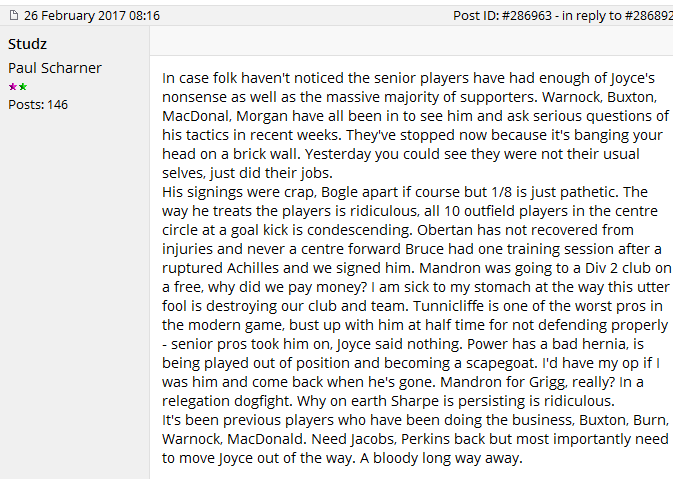 I have not posted on here for quite a while but after today`s abysmal performance i came on here to share my thoughts, but after reading the forum nearly all of them have been well documented in the above posts, but here i go anyway. When Joyce was appointed i saw it as a poor decision by the club , but i would give him time and support him up to and just after the transfer window, allowing him to bring his own players in and given them time to blend. A few weeks ago i thought he had proved me wrong after we had a couple of back to back wins. Well since the Utd game unfortunately things have gone back downhill drastically, with totally inept performance`s, team selection and tactics. After today performance I`m afraid to say my first instincts of him where correct, this guy is totally out of his depth . The final straw today were his tactics of playing two upfront but with no width to give the pair any service and when Obertan a natural winger came on he played him up the middle then he took Bogle who looked our must dangerous player, off. I can`t attend the fan`s forum on Wednesday but can someone please ask him if he his Owen Coyle in disguise. If you thought the second half at QPR was bad,this was worse. Today we managed to reach new levels of turd. Other than a Max Power cross Latics failed to make the Forest goalkeeper work, thankfully for us, Forest are just as garbage and Matt Gilks was a total bystander bar 1 good save from a deflected effort. Ultimately I thought the performance was dire, how Joyce can set up at home with Power and Tunnicliffe as wide men is baffling. Morsy looks a shadow of the player of a few weeks ago due to being moved into a holding midfield role -WHY!? I get the argument about the pitch but I thought our style of play was equally as poor. There were various times were the likes of Hanson, MacDonald and Buxton opted to hoof the ball into the channels rather than try and build a move. Another horrendous setup from Joyce. Taking Bogle off for Will Grigg shows how inept he really is. Anyone with eyes can see Grigg is a poacher- why bring him on when you aren’t creating chances? How Tunnicliffe lasted the 90 was beyond me, no way on earth is he a better option than Kellet or Colclough – both of whom would offer attacking flair although Mr Joyce doesn’t seem to like that. Absolutely no improvement from the Caldwell days. In fact we probably look less like scoring than we did back then!! WJ: “On another day some of the chances go in.” – no, they wouldn’t because NONE of them were on target. Today was the perfect opportunity to gain 2 points on 3 of our nearest rivals. If we lose next week the vengaboys will have proved that getting rid of your manager can save your season. While walking over the bridge I heard 3 different groups of fellas all saying the exact things. No width, all midfielders doing the,same job, Why did he bring Obertan on and play him up front when he’s a wideman, Why take off Bogle when were desperate for goals ?, 7 minutes won’t make make a sod of difference. I’m sorry but I don’t blame any player. This manager thinks that if he floods the midfield we can stifle the opposition. Zero shots on goal is embarrassing. And why the F bring on Gilby for 35minutes when he hasn’t played for months on end with bad injuries. 10-15 minutes would have been enough. Joyce, you did a fantastic job at Utd but it’s time to throw the towel in at Wigan and fook off, your out your depth. It doesn’t take a rocket scientist to figure out were your going wrong. It is genuinely worrying when a flock of pigeons spent more time on the right wing than any of our players. I was fairly hopeful of him being a success when he first arrived but the proof of the pudding is in the eating as they say and it is now quite patently obvious that the guy is clueless and out of his depth! Us and forest should be automatically relegated for arguably the worst game of football thats ever taken place Terrible display #wafc lots of effort but no game plan. Grigg ready to come on at 66 mins but only on pitch at 83! WJ out of his depth. I thought he was the only positive from today. He won headers and his hold up play was good. For me once he went off was when the Forest came into the game more. I know I’m clutching at straws here, but I wanted to say I think he did well today. Was far more involved than assombalonga was for them and he did more today than Craig Davies did in 18 months! Totally agree any chance of winning the game was over when he went off. Him and Bogle were a real handful he probably won more headers than any striker we’ve had since Heskey! Very impressed just needs some better service. The lad had some good points but was raw. However a fine prospect for the future and given our problems up front this season worth a punt up front in the next couple of games. The problem today was the lack of a winger to give both of the strikers service, it meant that one or the other was chasing down balls out wide. I would like to see them play closer together and be competing for crosses and knock downs as I think this is what they would thrive on. Or perhaps he spent 10 years hanging on the coat tails of others and knew his time was up ? The ‘sound’ foundations that he put in at United u23s are there to see since the beginning of their PL2 season …… If anyone else watches them on a regular basis, you will know what I mean. The correct job for the Coach was assistant manager job at Villa …. Our foolish Chairman (like so many others) then gets burned by hiring this Ferguson legacy and all the ex cronies that come along with that. How many of these United protégés have achieved anything ? I don’t think we are going to be relegated as the players still have a fighting attitude. There is trying not to lose and trying not to lose. Thank god i’ve not used my ticket since Nov been in hospital.Back now..Not missed a thing by all accounts. ← Fighting for points through set pieces?